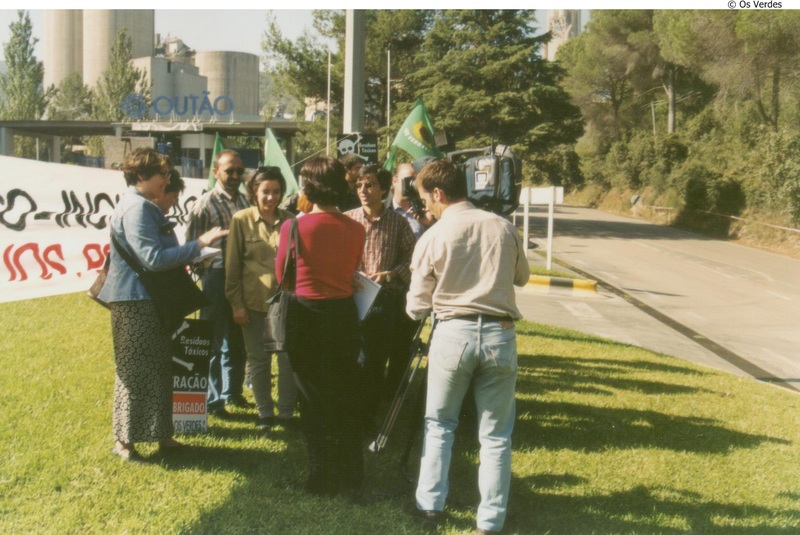 In 1986, shortly after joining the European Community, Portugal changed its waste management policy: the government chose to adopt co-incineration technology, in accordance with Directive 94/67/CE, instead of building an incineration plant in Estarreja. In 1996, it created the Institute for Waste (as part of the Portuguese Environmental Agency) and began to define the strategy on industrial (hazardous and non-hazardous) and urban waste, including waste from the healthcare sector. As the priority was to "add value" to industrial waste by using it as fuel or raw materials, burning the waste in cement kilns became a "perfect solution": it meant using less fuel for cement production and allowed for the reuse of dangerous waste. Some kinds of waste must be treated before being used in this process and, in this case, cement kilns must be adapted. In 1996, two national cement companies, Secil and Cimpor, in association with French-based Suez Lyonnaise des Eaux created a consortium named Scoreco. In July 1997, Scoreco conducted a study on waste production in the country and the types of waste that could be burnt in cement kilns (16,000 tons of waste per year). 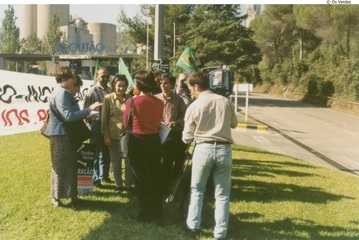 Protests took place between 1997 and 2000 in Maceira and, with greater intensity, between 1998 and 2002 in Souselas because of the air pollution and the noise from the plant. The epidemiological study in Souselas reportedly shows that the incidence of tumors and respiratory diseases among members of the local community is higher than in other communities in the central region of Portugal. In 1998, a coalition of NGOs and local institutions in Coimbra called the Committee for the Struggle against Co-incineration (Comissão de Luta contra a Coincineração) was created. Its activities included preparing scientific arguments to justify the demand for an epidemiological study, obtaining 50,000 signatures for a petition defending the suspension of the project (one of the biggest petitions ever in Portugal), organizing street demonstrations and coordinating efforts with Greenpeace and local institutions. In 1999, the government created an independent scientific commission to analyze the process. In 2000, it changed the location of the plant from Maceira to Outão. That was when protests in the new location began and then continued for two years. The choice of location was controversial, as it is inside the Arrábida Nature Park. At the end of December 2001, a new government was elected. It cancelled the co-incineration plan and began to develop a new strategy for waste management. Today, waste is burned in the cement kilns of Maceira and Outão (owned by Secil) and Alhandra (owned by Cimpor), but no conflict has developed at the local, regional or national level. ●CIMPOR-Souselas has had a license to co-incinerate hazardous and non-hazardous industrial waste since 2008. Reused waste includes animal meals, tire components, and forest residues (biomass), among others. In 2016, a group of citizens brought a complaint before the Central Administrative Court of the North, which ruled in their favor. It cancelled the company’s licenses and its exemption from the obligation to carry out an Environmental Impact Assessment on the incineration of hazardous waste. 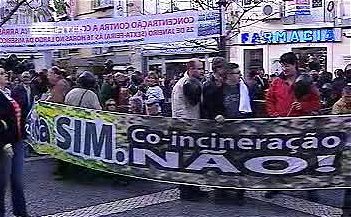 ●The SECIL-Maceira-Liz co-incinerator (of Cimentos Maceira e Pataias, S.A. - CMP) in Gândara dos Olivais, in the Marrazes parish, in the district and the municipality of Leiria has had a license to co-incinerate industrial waste (used tires) since 2006. ●The SECIL-Outão co-incinerator (of the Companhia Geral de Cal e Cimento, S.A.) in Outão, in the Anunciada parish, in the district and municipality of Setúbal has had a license to co-incinerate non-hazardous industrial waste since June 2005, and hazardous waste since October 2006. Project Details The cement factories with co-incineration technology in Portugal are Secil (Outão) and Cimpor (Souselas) and Secil/CMP (Maceira Liz). Scoreco's conducted a study that calculated that 16.000 tons of waste per year would be available for co-incineration. 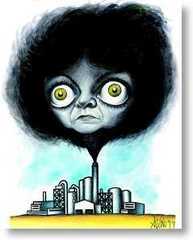 Other The cement production is a process that generate a lot of air and soil pollution mainly and noise pollution too. Other The epidemiological study in Souselas reportedly shows that the local community have more tumors and respiratory disease then other commuties in Center Portugal. Why? Explain briefly. The co-incineration plan was initially cancelled because of local protests and because the EU was building a new strategy for waste management. However, nowadays waste is burned in the cement kilns of Maceira and Outão (owned by Secil) and Alhandra (owned by Cimpor), but the conflicts is now less intense. Best Available Techniques (BAT, decision 2013/163/EU). This last document names the use of alternative materials as a BAT procedure for the cement industry. Best Available Techniques (BAT, decision 2013/163/EU). Use of alternative materials as a BAT procedure for the cement industry. BRANCO, Manuel, C.P. To be seen but not to be heard: scientific rationality versus democratic rationality in the decision–making process on dangerous waste management in Portugal. Universidade de Évora: Departamento de Economia, Tese de Doutorado, Jul. 2006. JERÓNIMO, Helena M.; GARCIA, José L. Risks, alternative knowledge strategies and democratic legitimacy: the conflict over co–incineration of hazardous industrial waste in Portugal. Journal of Risk Research, Jun. 2011. MATIAS, Marisa. Don´t treat us like dirt: the fight against the co – incineration of dangerous industrial waste in the outskirts of Coimbra. South European Society and Politics, v. 9, n. 2, p. 132-158, 2004. KIKUCHI, R.; GERARD, R. More than a decade of conflict between hazardous waste management and public resistance: a case study of NIMBY syndrome in Souselas (Portugal). Journal Hazard Materials, Dez. 2009. NUNES, João Arriscado Nunes; MATIAS, Marisa, Controvérsia científica e conflitos ambientais em Portugal: O caso da co‑incineração de resíduos industriais perigosos, Revista Crítica de Ciencias Sociais, 2003. Cement industry discourse . Interesting to see the positive view that they share about the process and how they are excited to "deliver a valuable contribution to environmentally sound waste management". 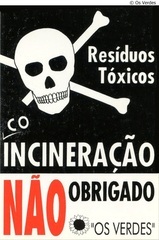 Article in "Não nos lixem"
Co-incineration suspended in Souselas, 2009.